Today, most Sales Ops teams are working hard to get beyond just generating a stack of sales reports, filled with nice-to-know numbers and metrics. And they're trying to figure out how to leverage their sales data to actually drive more profitable growth. In this expert interview, Dev Tandon talks about how leading companies are now looking at sales and business analytics differently. He discusses some of the most powerful analyses these companies are performing. And, he provides some great advice about working with sales to make sure the analytical insights and findings are being leveraged to the fullest. 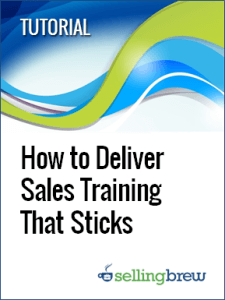 With the right approach, a sales training program can deliver lasting, profitable results. This step-by-step process guides you through designing effectiveness and stickiness into your sales training program right from the start.